In order to support the client East Mining Company to reach their plans of doubling mining and offloading of coal figures (from the 2017 annual record of 4.6 million t) and reach the target value of 8 million t, Bedeschi, based in Padua (Italy), leader in the solution for the bulk handling system, is completing a turnkey solution, consisting of the conversion of Emco-1, a self-propelled transhipment barge, into a new bow assembly and the cargo handling system installation in order to reach the planned capacity of 2500 tph. This solution enable the vessel to carry out offshore transhipping operations from shuttle barges to ocean going bulk carriers up to about 180 000 DWT, improving the sea keeping characteristic of the barge also in limited condition nearby the Shakhtersk port. The cargo handling system consists in a couple of receiving hoppers with an inner volume of approximatey 70 m3, filled by two Liebherr cranes, a couple of feeder belts with capacity of 1300 tph, three belt conveyors with capacity of 2500 tph and a slewing and luffing shiploader designed for the loading of Panamax vessels. 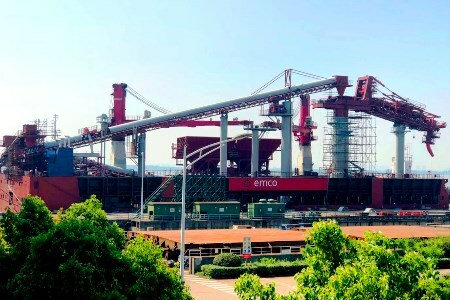 The solution has been conceived, fabricated and installed by Bedeschi with the support of the Chengxi Xinrong shipyard, based in JingJiang City (Jiangsu, China). At present, the vessel – including its CS – is completed and starting its operation in Shakhtersk port by the end of May.